Are you sick of seeing kale everywhere? Kale salad after kale salad. Kale green-smoothies. Kale chips. Dehydrated kale dust garnish. Or are you worried that kale’s recent entry on to some McDonald’s menus, will make it totally uncool? Broccoli leaves and cauliflower leaves could be the alternative you are looking for. They are nutritious, tasty, and offer extra karma points since they are often considered waste. 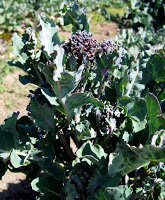 My recent connection to cauliflower and broccoli leaves began during a trip a friend and I took to an open house and plant sale at the Sunol Ag Park in Alameda County, California. While touring the Happy Acre Farm, my friend pointed out the cauliflower and broccoli leaves, saying that she especially loves cauliflower leaves, but that they are hard to find. From that point on, I started seeing these two underappreciated leaves on my media menu. A little while later, I was listening to the May 30, 2015 episode of Good Food from KCRW and the market report (from the amazing farmers market in Santa Monica, California) featured a chat with Bruce Kalman, chef at Union in Pasadena. Kalman has a bit of a reputation as a warrior against food-waste (e.g., mentions in L.A. Magazine and the L.A. Times) and much of the segment is about how his restaurant uses things that most people think of as garbage. At the beginning, he mentions cauliflower leaves in passing, but doesn’t say exactly how he has used them. Here is a page with the audio embedded as a SoundCloud player (the cauliflower leaf part is at the beginning). 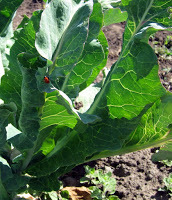 If Foxy Organic has its way, broccoli leaves will become a mainstream vegetable. In a piece for the Wall Street Journal (sub. only, summary at janeblack.net), food writer Jane Black reports that Foxy Organic is starting to sell broccoli leaves as a stand-alone product (using the trade name BroccoLeaf). Since you can’t have broccoli without a bunch of large leaves around the stem, the produce company finally decided to give them a brand name and start selling. The BroccoLeaf home page has a series of news clips that include BroccoLeaf appearances on Rachael Ray’s TV show and two appearances on local news in New York City, so the Foxy marketing team has been hard at work. Asking “…is garbage the new kale?”, Black also explores other examples of vegetable root to stalk cooking, like Dan Barber’s Blue Hill restaurant having a series of pop-up dinners that served “waste” foods and vegetables to stimulate discussion about the topic (Good Food had an interview with Barber about the dinners). What does it cost to harvest and pack a sellable quantity of normal cauliflower or broccoli? What does it cost to harvest and pack the leaves? These figures will clearly be different for a national company like Foxy that needs to print packaging, manage orders and so forth, than for a small farm that focuses on farmers markets and restaurants and therefore only needs to put the product into crates. What are the margins on cauliflower and broccoli? What do they look like on the less traditional leaves? Can leaves be a money maker? Is substitution an issue? For example, if a farmer were to offer cauliflower leaves at $1 per pound and cauliflower heads at $3 per pound, would sales of the leaves eat into their profit because too many people choose the now cool leaves instead of the stodgy heads? In any case, the overarching question that drives all of this is “Does anyone want to buy broccoli leaves or cauliflower leaves?” If I see them at the farmers market or grocery store I will certainly give them a try. Or, perhaps, I’ll try to grow some cauliflower in my garden.